As well as hosting the weddings and funerals of the kings and queens of England, the best English cathedrals, as well as smaller churches, chapels, and crypts have been featured in famous works of art and literature as well as in popular Hollywood film franchises. Notably, the incredible Gloucester Cathedral was featured as a set in several of the Harry Potter films and is high on the list to visit for any Harry Potter fans. England’s finest churches are typically in Norman or Gothic architecture, but a few are more modern, featuring works of modern art or neoclassical architecture. Visitors may also enjoy free choral performances at several of these sites, or view important sacred and historic relics, like two of the four surviving copies of the Magna Carta, which turned 800 years old in 2015. These copies can be viewed at Salisbury Cathedral and Lincoln Cathedral. In addition to the rich history and culture, you’ll find while visiting these important sites; the cathedrals can be a wonderful place to dine. Within the crypt, near the magnificent tombs of Admiral Lord Nelson and the Duke of Wellington, the café and restaurant at St. Paul’s Cathedral specializes in English cuisine, including locally-sourced honey from bees in Regent’s Park. 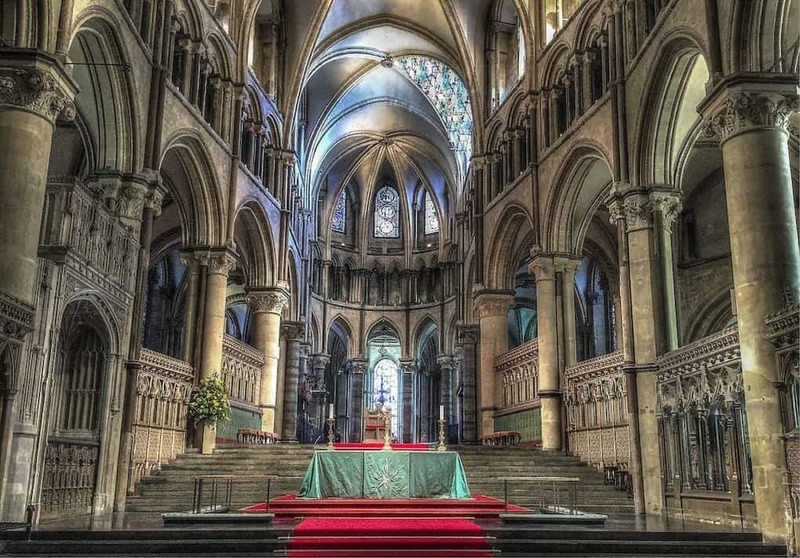 We’ve assembled a list of our favorite English cathedrals–you’re sure to be fascinated by history, culture, and care taken to build and preserve these pillars of the community. We’ve featured York on this site several times before, and there’s so much to love about the place but it is the Minster which is the city’s most important cultural site. 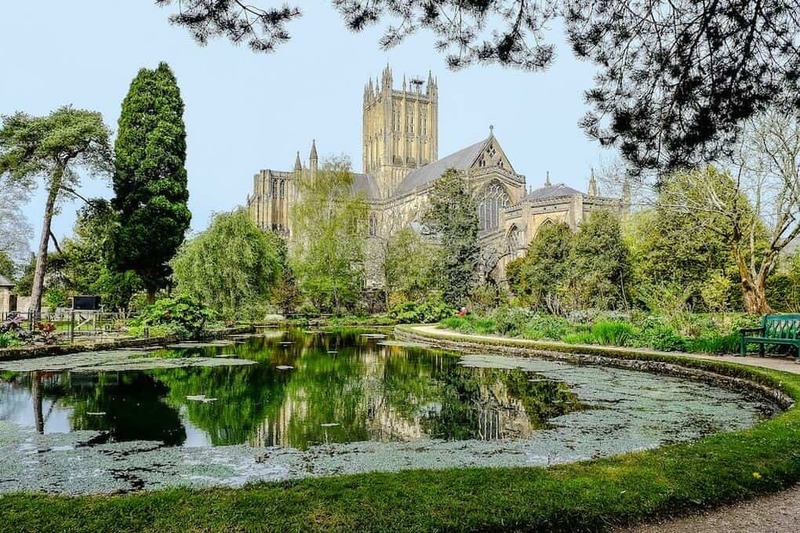 Towering over the city, the former priory (minsters are actually former monasteries) can be seen from miles away and is a worthy start to our list. The Cathedral and Metropolitical Church of Saint Peter in York, more commonly known as York Minster, is the cathedral of York, and is one of the largest cathedrals in Northern Europe. Canterbury is home to the Archbishop of Canterbury, the highest office in the Church of England and the head of the worldwide Anglican Communion. The cathedral, which is one of the oldest and most famous Christian structures in England, is also the scene of one of the most infamous assassinations in English history – that of Thomas Beckett by the followers of his adversary, Henry II in 1120. Aside from the cathedral, its home, the pretty town of Canterbury is well worth strolling around. As the Liverpool folk song goes: “If you want a cathedral, we’ve got one to spare…” Liverpool is home to both an Anglican and a Roman Catholic cathedral, which owes to a large Irish population. The Catholic cathedral is of modern construction and was finished in 1967 and is a proud symbol of the sectarian harmony achieved in a city with a long history of Catholic-Protestant tension. Liverpool Metropolitan Cathedral is the seat of the Archbishop of Liverpool and features a circular, modern, yet neoclassical design. This unusual cathedral is also part Chrischurch college founded by Cardinal Wolsey back in Henry VIII’s reign. It’s one of the 40 or so Oxford colleges, but the only one to house a cathedral. The nave, choir, main tower, and transepts are of late Norman architecture. The cathedral also features Perpendicular style architecture and a large rose window. 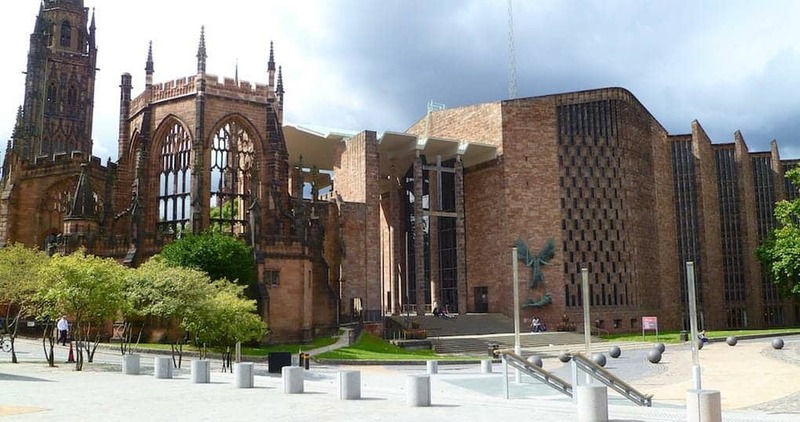 Coventry Cathedral has an interesting history. The original cathedral was bombed during the second world war, resulting in its near complete destruction. The community of Coventry set about building a replacement building during the 1960s, and the resulting modern design is a symbol of peace and reconciliation. Definitely worth a visit. The site now contains both the hollow ruins of the medieval-era building and the modern place of worship. The present cathedral, the masterpiece of Britain’s most famous architect, Sir Christopher Wren, is at least the fourth cathedral to stand on the site. The building was built between 1675 and 1710 after the previous building was destroyed in the Great Fire of London. The present day St. Paul’s saw the famous wedding of Prince Charles to Lady Diana Spencer in 1981, which was the first wedding of an heir to the throne performed in the cathedral for 480 years, with the last being the marriage of Prince Arthur to Catherine of Aragon in 1501. The Durham Cathedral is famous as a masterpiece of Romanesque architecture. Construction began in 1093 and was largely completed within 40 years, although work and restoration has been ongoing. Even today, a skilled team of craftsman continue to care for and maintain the building. 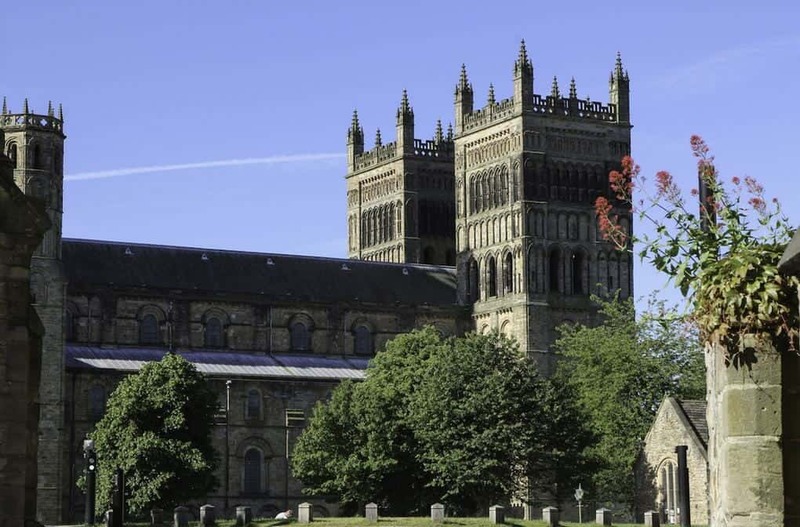 The cathedral is on the Durham peninsula, high above the woodlands and riverbanks–a dramatic setting for a site that boasts some of the most intact surviving monastic buildings in England. Salisbury Cathedral was completed at Old Sarum in 1092 under the first Bishop of Salisbury, and is a stunning example of early English architecture. The cathedral has the tallest church spire in the United Kingdom, and visitors can take the “Tower Tour” where the interior of the hollow spire, with its ancient wood scaffolding, can be viewed. The cathedral also has the largest cloister and the largest cathedral close in England and contains the world’s oldest working clock (circa 1386 AD). The cathedral also has the best of the surviving four copies of the Magna Carta. Gloucester Cathedral has been a place of Christian worship continuously for over 1,300 years since Osric, an Anglo-Saxon prince, founded a religious house on the site in 678-9 AD. Since, the site and Cathedral have seen important historical figures crowned and buried. 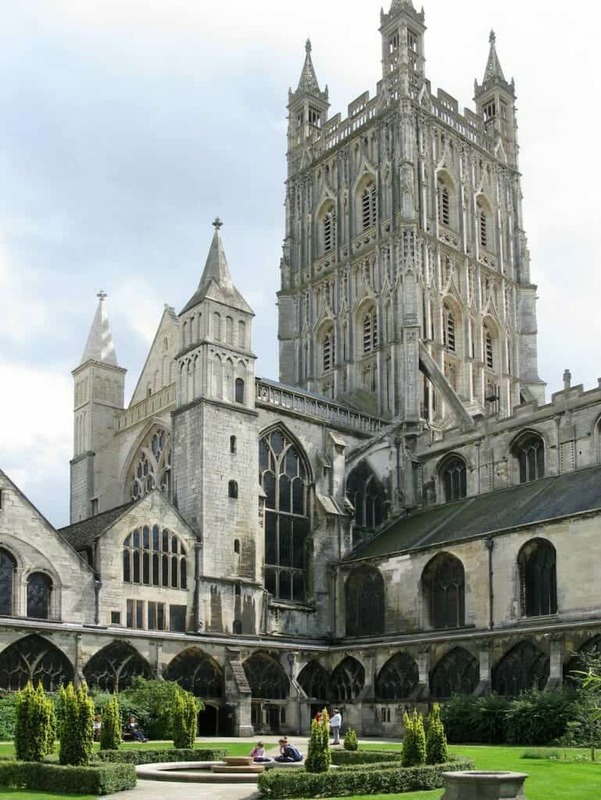 Henry III was crowned at Gloucester Cathedral, and Edward II was buried in the cathedral. 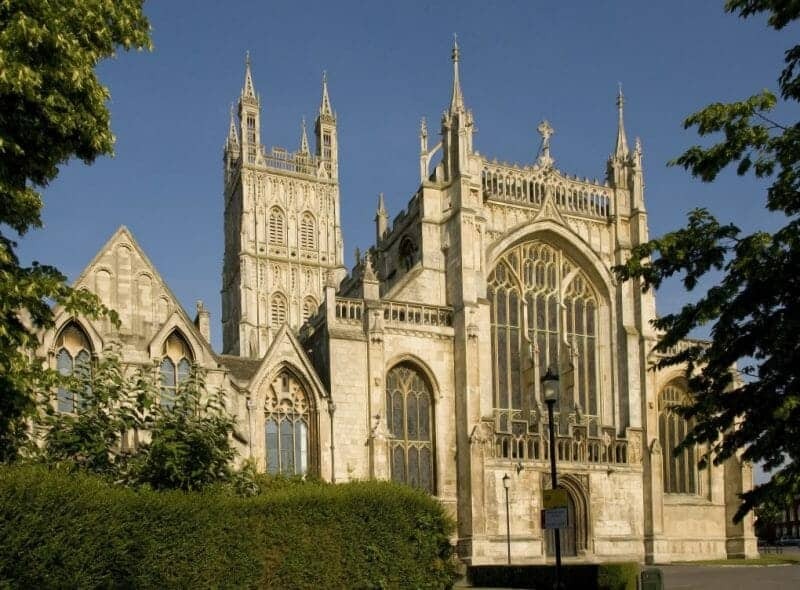 Gloucester Cathedral is filled with Romanesque, English Gothic, and Gothic architecture and is a must-see ancient house of worship. The cathedral was used extensively in the Harry Potter movies, with parts of it doubling as Hogwarts. Winchester Cathedral is one of the largest cathedrals in Europe, with the longest nave and greatest overall length of any Gothic cathedral in Europe. Winchester Cathedral has ancient roots; in 635 AD, Cynegils, king of the West Saxons, was baptized on the site. Later, this son Cenwalh built the first Christian church in Winchester. The small, cross-shaped church became known as Old Minster, and visitors can still see where it stood. The site is outlined in red brick just north of the present Cathedral. 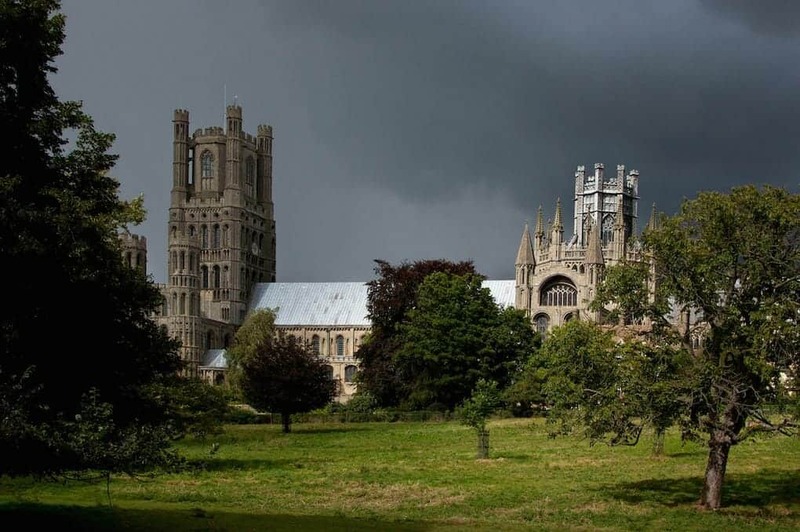 When Ely Cathedral was built, the town around it was just a small settlement. The cathedral itself has it’s origins in 672 AD, when St. Etheldreda built an abbey church. The present building dates back to 1083. Architecturally, the cathedral is outstanding due to scale and stylistic details. The most famous features is the central octagonal tower with a lantern. This creates a spectacular internal space as well as a unique exterior landmark. 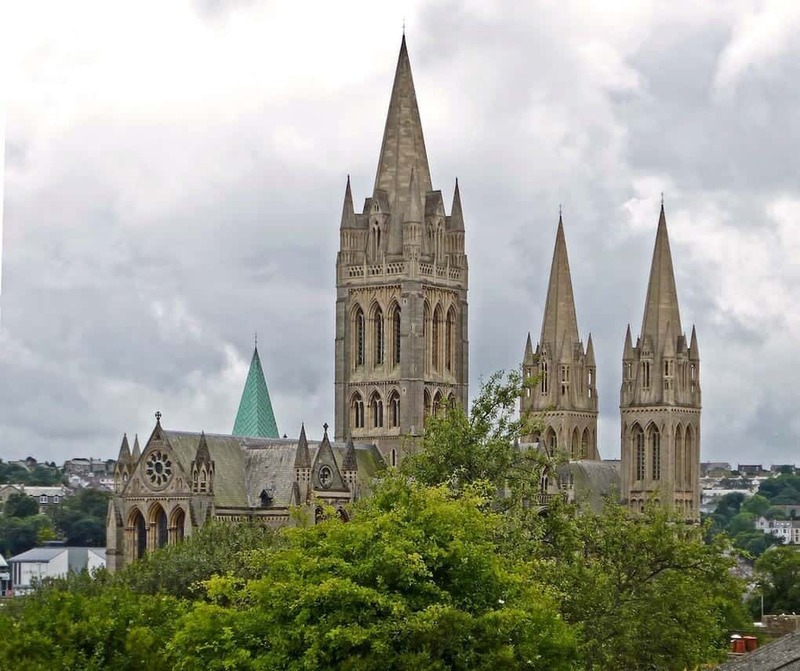 Located in Cornwall, Truro Cathedral was built between 1880 and 1910 in a Gothic Revival design. It is one of only three cathedrals in England with three spires. Inside, the Father Willis Organ, built in 1887, is widely regarded as one of the finest instruments in the country. Truro Cathedral is also the first cathedral to be built on a new site in England since Salisbury Cathedral in 1220. 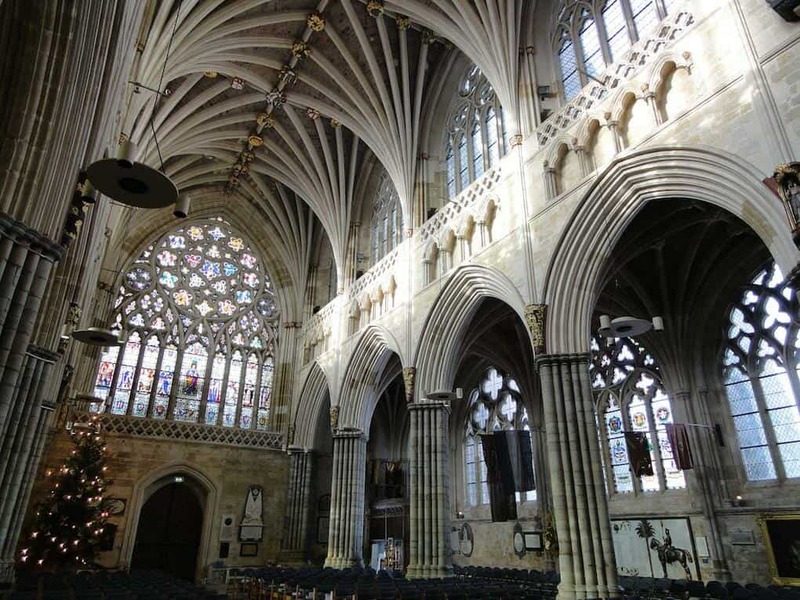 Exeter Cathedral was complete by 1400, and features an early set of misericords, an astronomical clock, and the longest uninterrupted vaulted ceiling in England. Misericords are small wooden shelves on the underside of folding seats, which were installed to provide a little comfort to a person who needed to stand for long periods of prayer. Peterborough Cathedral in Cambridgeshire, is dedicated to Saint Peter, Saint Paul, and Saint Andrew, whose statues look down from the three high gables of the famous West Front. The cathedral is known for its imposing early English Gothic façade. This has three enormous arches and is without architectural precedent. The exterior is slightly asymmetrical, owing to the incomplete second tower of the façade. Peterborough Cathedral is also the burial place of Catherine of Aragon, the first wife and queen of Henry VIII, and was the original burial place of Mary, Queen of Scots. Construction on Norwich Cathedral began in 1096, constructed originally out of flint and mortar, but aced with a cream colored Caen limestone. The cathedral was completed in 1145. The Norman lead-topped wooden spire is still visible today. Norwich is the most complete Norman Cathedral in England and one of the finest examples of Romanesque architecture. In recent years, the cathedral’s popularity has soared thanks to a pair of peregrine falcons. Today, the falcon pair and their chicks remain on a nesting platform. Visitors can get an up-close view of the falcons from an observation point within the close. The Wells Cathedral was built between 1175 and 1490, replacing an earlier church built on the same site in 705. It’s moderately sized, but has been described as “unquestionably one of the most beautiful” and “the most poetic” of English cathedrals. In the north transept is the Wells Cathedral Clock, an astronomical clock from about 1325. This is the second oldest working clock in England. The Lincoln Cathedral was built between 1088 and continued throughout the medieval period. Reputedly, it was the tallest building in the world from 1311-1549 until the central spire collapsed and was not rebuilt. Lincoln Cathedral is also one of the few English cathedrals to be built from locally sourced stone. It also has a unique legend associated with one of its carvings: the Imp. According to the 14th-century legend, two imps were causing mayhem in the cathedral. An angel appeared and ordered them to stop, but one imp climbed a stone pillar and threw rocks at the angel. The angel turned the imp on the pillar to stone, allowing the second to escape. The cathedral was probably founded in the 8th century, but the present building is of Norman architecture and was probably built in the 11th century. The building also shows signs of Gothic and 19th century additions. 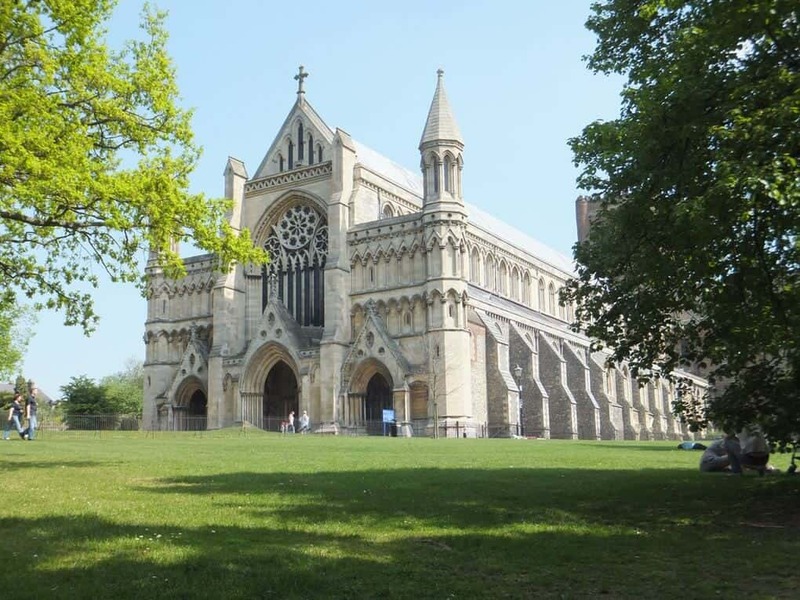 The cathedral is named for St. Alban, a Romano-British citizen living in the valley below the site of the current cathedral. He harbored a fugitive priest and was converted. When authorities came to arrest the priest, Alban allowed the priest to escape and was taken in his place. He proclaimed his new faith and was martyred. The site of his execution became a place of pilgrimage, and the shrine dedicated to Alban, as well as some of the original relics of the saint’s body, are still within the cathedral. 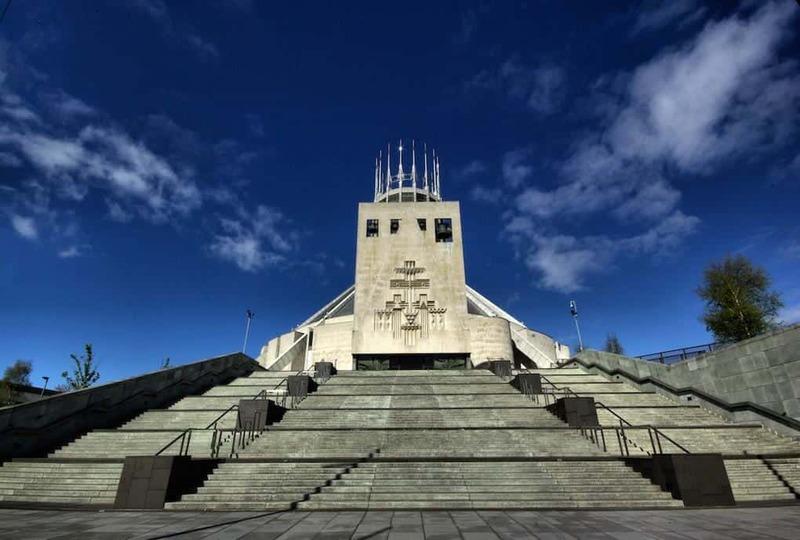 The second of Liverpool’s cathedrals is based on a design by Giles Gilbert Scott, and is the longest cathedral in the world with a total external length of 207 yards. Like its Catholic counterpart, the Anglican cathedral is fairly modern, with the founding stone laid by King Edward VII in 1904 and the completion of the building attended by Queen Elizabeth II in 1978. The cathedral is home to “The Welcoming Christ”, a large bronze sculpture by Dame Elisabeth Frink. The sculpture was installed over the outside of the west door in 1993. 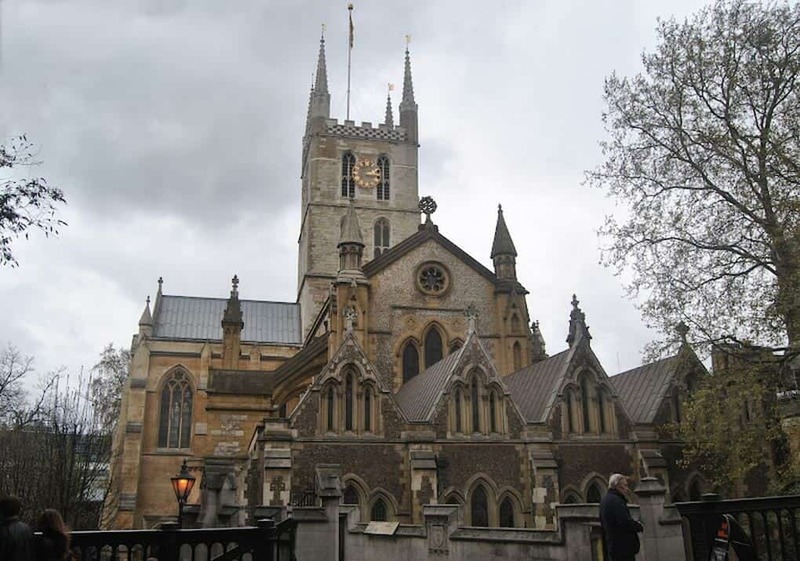 Southwark Cathedral has been a place of worship for more than 1,000 years, but was only named a cathedral in 1905. The present building retains the basic form of the Gothic structure built between 1220 and 1420, although the nave is late 19th century. Notably, the cathedral is home to a large stained glass window dedicated to William Shakespeare and depicts scenes from this plays. At the base of the window is an alabaster statue representing the playwright reclining and holding a quill.